Building a resilient and passionately aligned team is the job of every leader. While there are several strategies for creating teams, they fall into two broad buckets — Uniform teams and Diverse teams. Uniform teams, as the name implies, consists of people who have similar skill-sets and are ideal for tasks that are routine, modular, requiring consistency and standardization. Think of a BPO or a fast food franchise, whose competitive advantage is the ability to provide a similar experience and scale rapidly. In the army, such teams could be equated with Infantry battalions or Armored/Artillery Regiments who have more or less the same tasks, and will be required to work with other infantry battalions/regiments and hence uniformity and standardization allows rapid scaling. Uniform teams are ideal when the task is clearly defined, the environment is fairly predictable and past knowledge is easily transferable. This is what allows a BPO to learn from one unit and quickly transfer that knowledge to other units or allows a fast food franchise to discern bestselling items on the menu and replicate that across all outlets. Diverse teams by comparison are smaller, consisting of members who are very different from each other and hence bring different skills to the table. Such teams consist of handpicked individuals with idiosyncrasies and hence by definition cannot scale. But the inherent diversity of the teams allows them to be highly innovative, agile and nimble. High technology companies, start-ups, or highly entrepreneurial environments, necessitate diverse teams because the environment is unpredictable and past knowledge is not only irrelevant but in some cases; can be downright detrimental. That is what allows Elon Musk to build a car which established automotive companies could not conceive of, or enables AirBnB to grow bigger than the largest hotel chain. Similarly ‘past knowledge’ handicapped Barnes & Nobles’ agility in the face of competition from Amazon. The Army’s equivalent in this category, are the Special Forces who consist of teams with immense diversity. For example a five man Special Forces ‘Hit Team’ could consist of a linguist, a demolition specialist, medic, a sniper and a communication expert who would usually be tasked with a clear strategic intent, but a very nebulous blueprint. Such teams would be inserted into enemy territory with scanty intelligence and expected to improvise on the fly. Diverse teams are ideal for VUCA environments where the organization is guided by a north star towards a general direction, but doesn’t have or cannot have, detailed road maps. It requires the team to be agile, adaptable and appreciate that by definition, their operating environment will be a fog of war, instead of predictable certainty. To understand this construct better, it is helpful to use a metaphor of “tiled team” versus “jigsaw team”. As we know, tiles are uniform in size, shape and design. Since they are exactly like each other, we can estimate the number of tiles required by simply calculating the surface area of the wall and entire buildings can be tiled rapidly. The tiles fit next to each other, because they have exactly the same dimensions (interfaces). And when a tile breaks or cracks, it can be easily replaced with another tile. All one needs to do is to pry out the tile from its place and glue another tile instead. These are the advantages of a ‘uniform’ team. But a ‘tiled’ team has its downsides as well. There is virtually no diversity as every part of the team looks and behaves exactly like any other. So elements like innovation, improvisation and agility suffer. Secondly, the tiles are stuck to the wall (the organization) and not to each other. So bonding between the tiles is non-existent resulting in very little collaboration. And when one tile cracks or breaks, there is no room for that tile in the team any more. Matter of fact, variance from the norm is the sole reason that broken tiles are replaced or for that matter not selected in the first place. But no matter how strong the tiles are, the mosaic always begins to crack at the joints between them. A jigsaw puzzle on the other hand, consists of pieces with uneven shapes and sizes, which all fit together to complete the picture. Since the pieces are unique, each brings a different value to the overall result. And every piece is valued equally regardless of its size or shape. Their uniqueness is celebrated, not disparaged because it is the very variances, which allows the puzzle to be completed. More importantly, each piece fits in with several other pieces in very unique ways. Every piece needs to have a ‘gap’ (deficiency/vulnerability) for the other piece to be able to fit in with its protrusion (strength). If a jigsaw piece breaks, there is no need to replace it because the whole picture is made up of ‘broken’ pieces anyways. A jigsaw is harder to build than a tiled wall. A jigsaw team requires the leader to have the vision of the end picture and to handpick individuals mapping their weaknesses more than their strengths. A leader needs to experiment with several pieces to see which one fits best where, but once assembled, a jigsaw team is interdependent, strong and resilient. 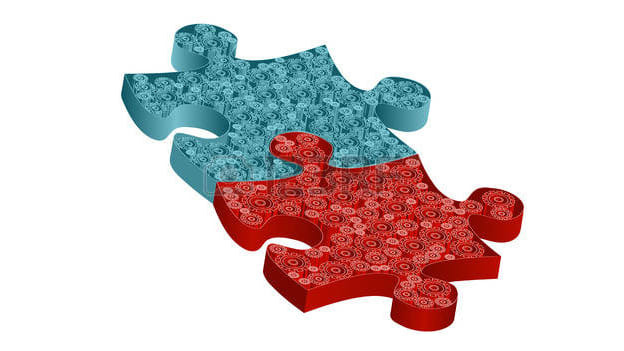 More importantly, jigsaw pieces can combine in different ways to address different needs and the pieces have more camaraderie because they know that can't fit in tiled organizations. This bond between the pieces is what allows a jigsaw puzzle to be lifted off the table by holding just two pieces in the edge. If you tried that with a tiles arranged to each other, only the two tiles you held in your fingers would come off the table. All of us are like pieces of a jigsaw puzzle. We have our strengths, deficiencies, protrusions and gaps. Traditional corporates glorify strong, stoic, unwavering & highly driven personas. But that is unreal and unsustainable. Deep down, we all have our insecurities, egos and fears. The delta between corporate expectations and core reality, wastes immense amount of energies in just ‘covering up’ – feigning strengths we don’t have or pretending to be people we aren’t. Instead of building around strengths, jigsaw teams are best built around vulnerabilities. The leader sets the tone by acknowledging her weaknesses, vulnerabilities and fears. She does this by sharing her back stories, being self-disparaging and brutally honest about what makes her vulnerable. That allows the team to exhale and ‘come out’ from the personas they have been hiding behind, unlocking enormous energies that were being wasted ‘competing’ rather than complementing each other. As organizations move towards an unpredictable world, they have two choices. The first is to try and ‘anticipate’ every future risk and develop mitigation strategies. But that is a zero sum game. By definition, it is impossible to predict future black swan events based on past experience. The other alternative is to emulate the Special Forces leadership model and create teams whose diverse skills, deep bonding and inherent resilience, helps them discern threats and opportunities faster and react to them decisively, within the window of opportunity. A jigsaw team is certainly harder to build – but then – real leaders are not needed for easy jobs! Raghu Raman is former CEO NATGRID and Group President Reliance Industries. He tweets @captraman & views are personal.